Here at Clive Emson, every so often we come across a property that ticks all the boxes and offers both a great opportunity and value for money, and we think this gem in sunny Brighton is just the ticket. So we are delighted to be auctioning a shop in the historic North Laine! The freehold shop and upper parts are going under the hammer at our December auction in Brighton. 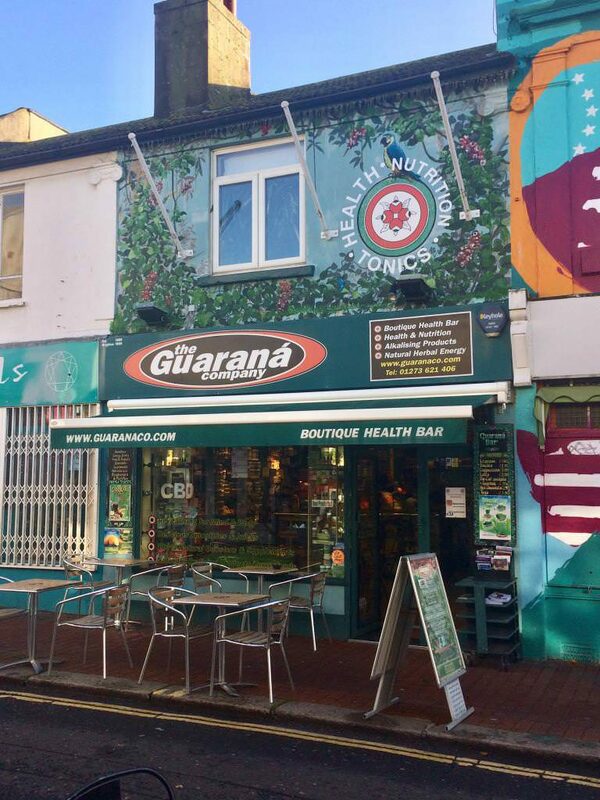 Located on the east side of Sydney Street, the shop is currently trading as the Guarana Company, a popular health store and juice bar. Its central location makes up part of the North Laine, a row of narrow streets built in the late 18th century which today are abuzz with independent shops, bars and restaurants. The property is separated into four floors. The lower ground floor has an office, store room and access to the rear yard, where there are four storage units and secure rear access to Gloucester Street. On the ground floor, you have the retail area and stairs that lead to the first floor where there is a customer seating area that seats approximately 30 people and a cloakroom and W.C. The property has been well maintained, has part double-glazing and offers an amazing commercial opportunity due to high footfall North Laine receives. What’s more, the Seller may consider including fixtures and fittings for sale by negotiation. The North Laine offers an array of independent commerce from vintage shops to florists to bakeries. This is, therefore, the perfect opportunity to open up that business opportunity you’ve been dreaming of in an area bustling with shoppers! It is also close to the mainline train station and Brighton’s famous seafront, both under a 15-minute walk. In the Georgian era, Brighton developed as a fashionable seaside resort, encouraged by the patronage of the Prince Regent, later King George IV, who spent much time in the town and had the Royal Pavilion constructed as a royal residence. Brighton continued to grow as a major centre of tourism following the arrival of the railways in 1841, becoming a popular destination for day-trippers from London. Today, Brighton is the most popular seaside destination in the UK for overseas tourists. The shop will go to auction on Wednesday 12 December at the Hilton Brighton Metropole with a guide price of £600,000 to £625,000 plus fees. If you would like to arrange a viewing of this fantastic property please call us on 01273 504232.